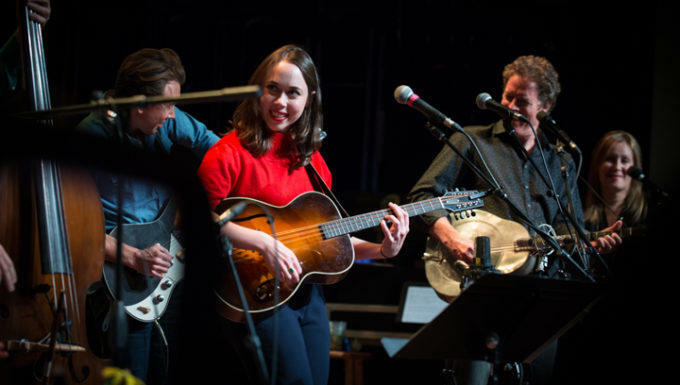 This week, we welcome back long-time friend and musical virtuoso Sarah Jarosz to the eTown airwaves to share from her latest collection of songs. Sarah continues to skyrocket in her career, all while doing things her own way. We’ll learn more about what’s happening in her world these days, during her conversation with eTown host Nick Forster. Also, eTown newcomers Hymn for Her bring their unique brand of Americana music to eTown’s solar-powered stage. All of this, plus a one-of-a-kind musical finale collaboration, and an inspiring eChievement Award story – this week in eTown. Hear eTown every Wednesday night at 10:00 pm on KRCB-FM Radio 91!